Only half of one per cent of fines issued to drivers for illegal parking related to parking on cycle lanes. Browned off with continued illegal parking and a lack of enforcement, Cork cyclists are holding a protest outside City Hall. Cyclists in Cork are so frustrated at the continued problem of illegal parking in cycle lanes that they are taking their protests to the streets. The Cork Cycling Campaign has been trying to tackle illegal parking in Ireland’s second city for many years. Those efforts have included campaigning on social media and attending, and trying to influence, Joint Policing Committee meetings where policing priorities are set. However, with illegal parking continuing unabated and just one half of one percent of parking fines issue in Cork going to drivers parking in bike lanes, the group is stepping up its protest. On Monday it will stage a rally outside City Hall; the first time the organisation has held an on-street protest. 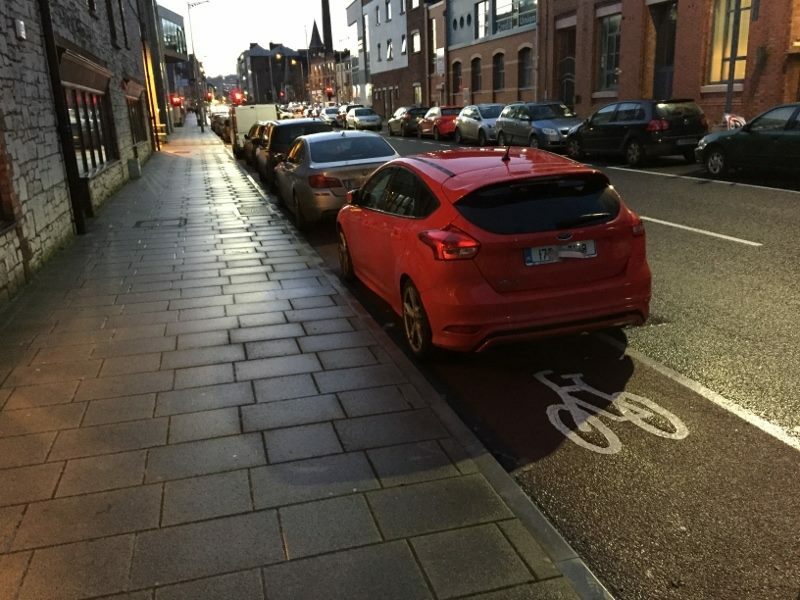 “Illegal parking in cycle lanes is a hazard as it forces people who are cycling to leave the cycle lane and merge with vehicular traffic,” Conn Donovan of Cork Cycling Campaign said. “Illegal parking in cycle lanes also discourages people from taking up cycling. They can see cars blocking cycle lanes when they are driving or walking around and assume that Cork is not a bike-friendly city. “Councils in other parts of the country, like Dublin and Tralee, have listened to the cycling community and installed bollards, orcas and other low-cost solutions. On Monday when the cycling protest is taking place outside City Hall, inside the council pro cycling motions will be voted on. Cllr Fiona Ryan (Solidarity) has submitted two motions to the Cork City Council ‘roads department’ calling for infrastructure such bollards, kerbs and armadillos to be installed. These would safeguard several bike lanes that suffer from persistent illegal parking. Cllr Ryan’s motions and the accompanying report from the director of services will be voted on on Monday. And it is intended that the rally on the street outside will drive home the level of support in Cork for free and open cycle lanes. The cycling protest will take this Monday, February 11th, from 5pm. And the campaign is urging cyclists and bus users tired of being delayed by illegal parking to attend the event. Because cycle lanes and bus lanes run along the same stretches of roads, illegal parking in cycle lanes often also blocks buses moving around. And in tight city streets the disruption caused by even one vehicle parked illegal for a short period can be serious. “The vast majority of people driving in the city park legally and safely. A small minority have been enabled to carry on this dangerous practice however,” Conn Donovan said.